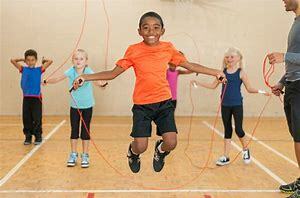 The Key to teaching children how to jump rope, is to start out as easy and basic as possible. You can always increase the difficulty as time goes by to challenge your students. 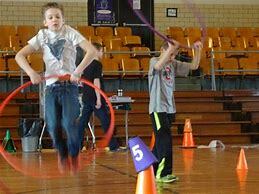 Lay a jump rope on the ground and have your students jump side to side. Same as above front to back. Hop on one foot side to side. Same 3 drills as above with an increased height of the rope. You can have partner hold the rope or tie them to cones. Snake drill: Simply have a partner shake the rope side to side as if it is a snake and partner will jump over. Wave drill: You’ll need groups of 3. Two partners will make waves with the rope, so it will now be higher off the ground then the snake. The other partner will attempt to jump over side to side or front to back. With a partner, slide the rope in a circular pattern while one partner jumps over the rope. Make sure the rope stays ankle high. If the rope hits a partners feet or ankles, switch the jumper. Skill 1: Swing rope over the head with two hands and let it hit your feet as it comes around. Once it stops, then you jump. Skill 2: Same idea but attempt to jump this time. Only one jump. Skill 3: Continual Jumping with two feet at the same time. Single bounce and double bounce. Skill 5: Front/back. One foot always stays in the front and the other stays in the back. Skill 6: Side to side as if your skiing. Skill 10: Squat: Squat low and back up as you jump. Skill 12: Hold two hands together and swing rope to each side of the body with no jumping. Add jumping, then attempt to mix with jumping over the rope. 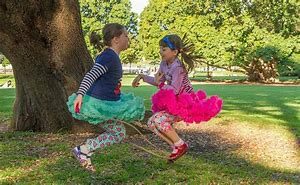 Skill 13: Double jump (swing the rope around twice before landing on the ground). Skill 14: Cross arms as you jump the rope and re-open and you swing the rope around. If you don’t want any of your students to turn the rope, you can tie it to another object while you turn the rope. One at a time as you turn the rope one student will jump threw the rope and than go to the end of the line. After all students have gone once, have them jump threw in pairs. Then groups of 3, 4 and so on. Challenge the class to see the highest number they can achieve. GROUPS OF 3. Two turners and one jumper. Allow students to perform continual jumping in groups of 3. 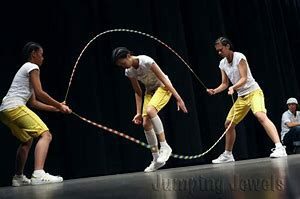 DOUBLE DUTCH: This is a much higher level, but worth teaching if your students have mastered the other skills. Use a small rope, with one turner, but the turner and their partner will jump. 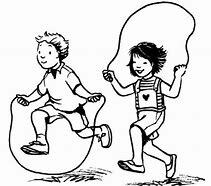 Skill 1: Simply turn rope and both partners jump. Skill 2: This time the turner will start turning the rope and the partner will need to enter and begin jumping. Skill 3: Partner not turning the rope will attempt to do a 180 or 360. Skill 4. Partner not turning the rope will attempt to touch the ground. Skill 5: Partner’s stand side to side and they both turn the rope and jump together. Station 1: Small jump ropes for individual jumping. Station 2: Long Jump ropes. Each group can rotate who is turning the rope when in this station. Station 3: Teacher turns the rope that is attached to another object. I use a stair rail. Attempt having all the kids in the group jump at the same time. Station 4: Ankle band jumping. Station 6: Hula Hoop jumping. Let’s say 5 teams of 5 all lined up behind the designated cone. The first player in line will jump the rope as they move forward to one end of the gym and back. The same race can occur with all or half the class at one time. They will jump rope at the same time while moving forward from one end of the gym to the other. This can be done with one large group or smaller groups. One player or the teacher stands in the center of the circle. The rest of the group forms the circle. The player in the center, will hold a long jump rope with a rubber deck ring tied to the end of it. The player with the rope in a circular pattern, below knee level, while the rest of the group jumps the rope. When a player is hit with the rope, they’re simply out of the game. OPTION: Player that is out, must perform an exercise such as jumping jacks, 10 seconds wall seat, burpees, etc… Once they complete the exercise they may return to the game. 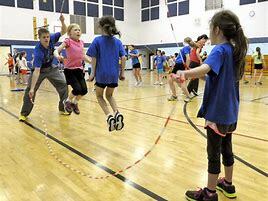 Students find an opponent to jump rope against. Whoever jumps rope the longer amount of time gets a win and looks for another opponent that won. The student that lost looks for another player that lost. If 1 minute passes and both players are still jumping, than consider it a tie and look for someone who won. OPTION: You can turn this into a tournament. As players lose matches, they’re out. Only the winners will keep competing vs other opponents. NOTE: We don’t like to have students sitting out for too long. Make sure you have something else for the other students to perform. I always recommend stations when doing something like this. Half of the gym can be used for the competition and the other half can be broken up into 3 stations. NEED LARGE GROUP GAMES? CLICK HERE! I hope you enjoyed these activities. Video coming soon, to demonstrate. Please feel free to leave a comment or question below.